It is no secret that many project managers start their careers as a promotion from a technical position. The IT world is full of Project Managers who were programmers, for example. It’s not a surprise then to realize that while many PMs excel at the technical side of project management, many have difficulties with their “soft skills.” Enter Margaret Meloni, MBA, PMP. Margaret is a speaker, writer and teacher who supports project managers with the human side of project management. Margaret was kind enough to answer some of my questions specifically on how she got started and what tips she can give to those looking to start a career in project management or apply project management principles to their small businesses. Cesar: Can you tell us how you got started in Project Management? Margaret: Have you heard the term ‘accidental project manager’, that was me! I knew I really wanted to be in a position of leadership, but I was not sure what that would entail. I had actually started to give up on being in a leadership role. I was a computer programmer and I decided, “Oh well, I guess I will just hang out in my cubicle until I retire. THAT is when opportunity knocked. Here is what I knew about my new position. I was not officially the boss, I was not a technical lead and I was not supposed to be doing any programming. One day in a meeting someone looked at me and said, “Well YOU’RE project manager.” And I thought, “OK so that is my title.” But I kept going and unwisely I did not bother to find out more about what it meant to be a project manager. Then the company started a PMO. The head of the PMO interviewed me about my work and he said to me, “Well you are using the PMBOK, right?” I did not know what a PMBOK was and I made silly comment “What is a PMBOK, it sounds like a Dr. Seuss character.” Well as you can guess he was NOT impressed with me. Luckily I was somehow doing something right and my management said, “Let’s keep her and get her some training.” Then I found out what it meant to be a project manager. 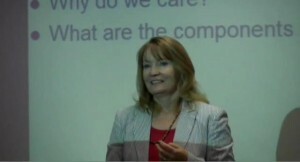 Margaret Meloni talking about "Emotional Intelligence." Cesar: I love the Dr. Seuss story! Looking back now, what advice can you give to those planning to start a career in Project Management? Cesar: Great. Many of our readers are small business owners. What is the most valuable PM concept/technique one can use in their small business? Margaret: Wow, there is so much I use every day to help with my business. Communications management of course, risk management of course, cost and time too. What I think really helps me the most is to understand at all times my highest priorities and what I need to do to meet those priorities. It is really a combination of project portfolio management, time management and scope management. I do not have unlimited funds or resources, so it is critical for me to understand what is the most important thing for me and my team to work on right now. Without doing this my team and I could work many, many hours on tasks that are not benefiting the business. And as much as I love my work, I love to take some time away from work too. Margaret: I love this question because my family and friends do tease me about being a ‘planner’. So you can see that I definitely bring planning to my personal life. However; I have also learned that it is good to have a plan but when you are talking about time spent and activities with family and friends it is smart to be flexible with your plan. The point is to spend time with people you care about, not to fit that time to an agenda. In terms of completing my personal ‘to-do’ list, critical path thinking really comes in handy. It really saves you time when you are doing your household chores or running errands when you think about it in terms of the critical path – what really has to happen first, then what is next etc. I definitely do this when I am cooking for family and friends so that everything comes out of the kitchen on time. Margaret: We are very fortunate in terms of the amounts of information and resources we have available to us. We can network with project managers from all around the globe. Find sites (like this one) to interact with others. You can easily find project managers on Twitter, Facebook and LinkedIn. Make contact with others and learn about what they do. Do not forget to volunteer! Volunteering your time is a wonderful way to hone your skills and get to know others who share common interests with you. And I must say this, work on your people skills. Project management is about people. Cesar: Margaret, these are great insights, and I thank you very much for taking the time to answer my questions. 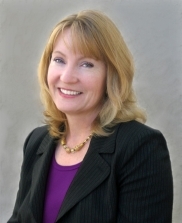 For more information on Margaret Meloni, visit her website. One of the sources of your inner peace is your own self-awareness and self-acceptance. This the kind of peace that allows you to handle conflict and other difficult situations in the workplace and beyond. It is the inner peace you create that allows you to bring peace to the outside world. A great way to work on this is to step back and think, ‘What agreements have I made with myself? Remember, it is how you deal with the conflicts and difficult situations in life that defines who you are. And YOU decide how YOU will react to the world around you. Are you ready to agree to YOUR own peace?